Knitwear designer Michel Bergamo and architect/photographer Cristina Zamagni collaborated to create Boboutic in 2000. 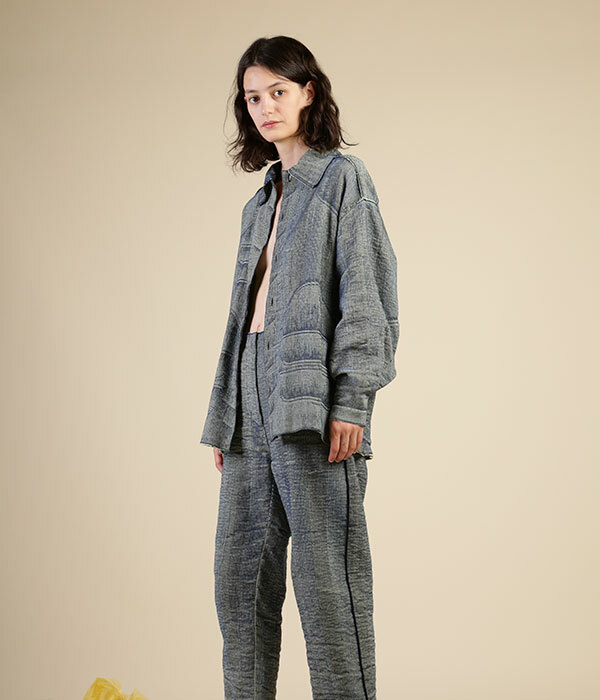 Taking everyday experience and injecting it into their knitwear, the designers create innovative pieces in which traditional knit-and-stitch techniques are combined with a constant research for new materials and production methods. Boboutic has been presented during Paris Fashion Week since 2001. Michel Bergamo (Lausanne, CH) is a fashion designer. He teaches Fashion Design at IUAV University inVenice. Cristina Zamagni (Rimini, I) is an architect and photographer. She teaches Fashion Design at IUAV University, in Venice. Niccolò Magrelli (Rome, I) is a fashion designer. He joined Boboutic in 2012. One of the brand’s most important objectives is to find new ways for the knitwear to tell its own story. The yarn, considered as an endless line, is ideally kept intact by rejecting the use of scissors in the making of the garments. Boboutic designers consider knits an ideal medium, since its versatility allows conceiving unique surfaces and unexpected shapes. Boboutic’s approach to knitwear is unpredictable, aiming at creating a product where materials and structures compensate each other. The main inspirations are the ordinariness of everyday life, geometry, Gordon Matta Clark, “Of Mice and Man” at the 4th Berlin Biennale 2006, cibachrome, Luigi Ghirri, differences and contrasts, the East. The interest of Boboutic for other artistic disciplines – mostly visual art, performance and filmmaking – is proved by a series of collaboration with diverse artists, invited to interact with the brand philosophy by producing original artworks, related to the cornerstone of each collection. During the years, several artists have responded to Boboutic’s invitation, among them: Fanny&Alexander, Kinkaleri, Marco Mazzoni, Jacopo Miliani, Davide Savorani and Zapruder filmmakersgroup.